For about a year, I’ve been trying to take my art digital, and learn to create digital illustrations via a drawing app on a tablet. Initially, I purchased and learned on a Surface Pro 4 using an app called Sketchable. Through my trial and error learning, I even created a post of tips and tricks for drawing on the surface Pro 4. As I’ve increasingly transitioned to digital illustration- but also continued to struggle with drawing on my Surface Pro- my curiosity got the best of me. 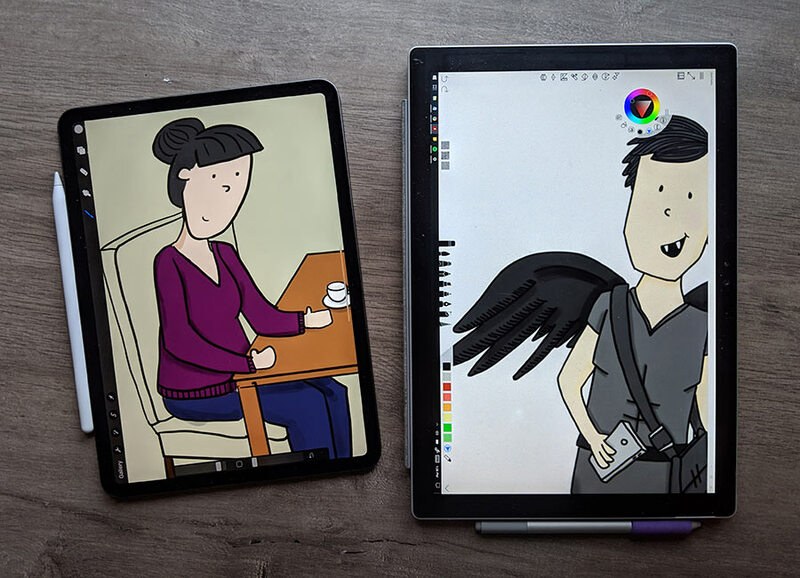 So when Apple released a new iPad Pro in late 2018, and along with it a second-generation Apple Pencil I decided to order both and do an artist side-by-side comparison of these two powerful digital illustration setups. 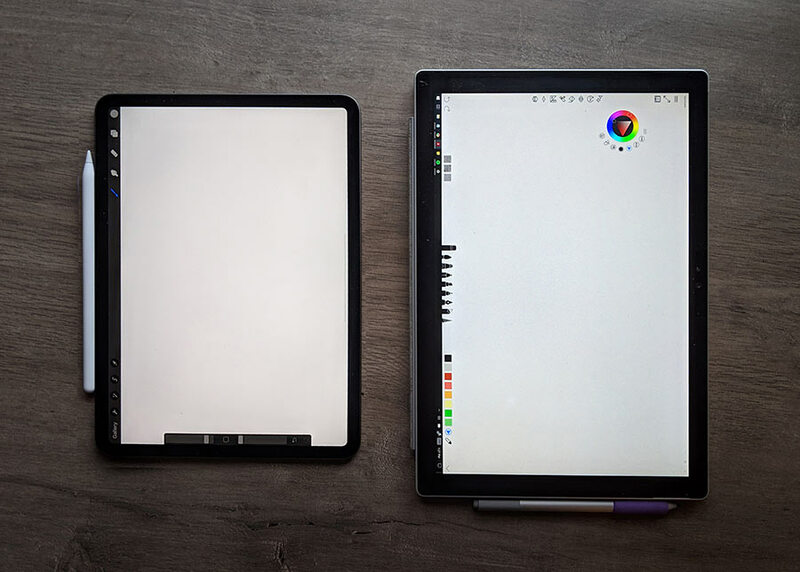 Tablet: Transitioning from a 2015 iPad air, my first impressions of the new iPad was surprise that the dimensions and weight seemed identical. Although they differ slightly, in hand, the 11 inch iPad was nearly identical in dimensions and felt very similar in weight in my hand. Drawing Stylus: My initial impression of the pencil was instantly favorable. The 2nd generation Apple Pencil feels incredibly light in the hand. 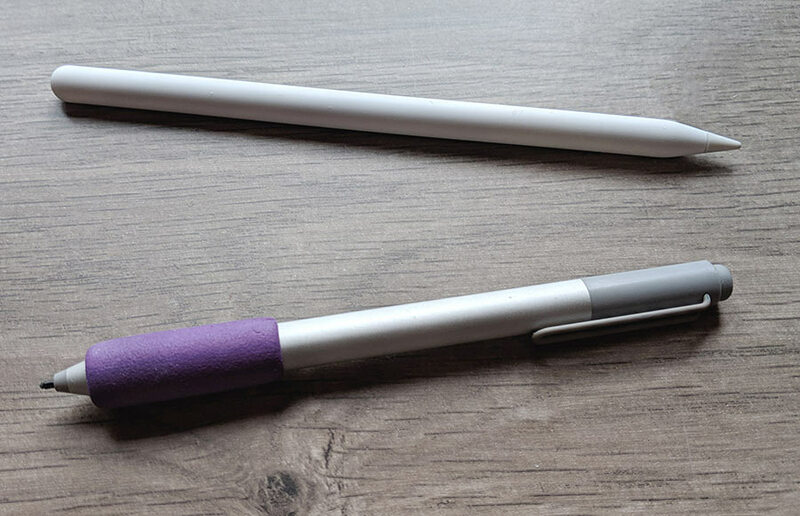 Compared to the Surface Pro Pen the Apple Pencil is thinner, shorter, and lighter weight- making it easier and more intuitive to hold, use, and draw with. After drawing with the new iPad for about a week, it’s clear that I’ll not be abandoning my Surface Pro anytime soon. I thought I would break down my analysis on a couple levels. 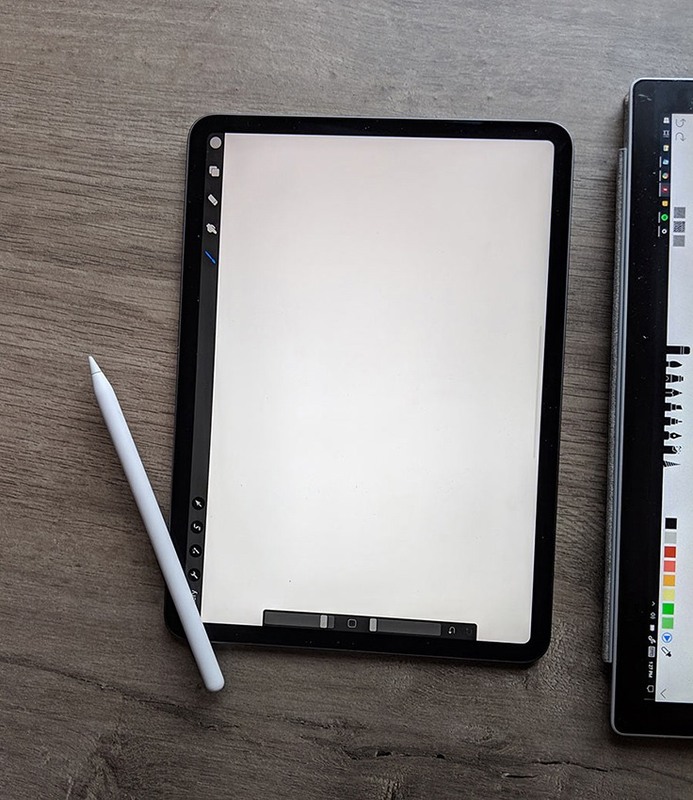 Keep in mind, my review and comparison are exclusively reviewing these two tablets, their matching stylus, and the available illustration software on the basis of suitability for and ease of making professional quality digital art. In terms of tablet hardware, although the iPad Pro is lighter, a bit smaller, and because of those, easier to maneuver, when it comes to the tablet itself, I prefer drawing on the Surface Pro 4. Why? I realized how much I have come to appreciate the hinge on the back of the Surface Pro. The powerful hinge allows it to be adjusted to just about any angle – something I very much rely on when drawing. 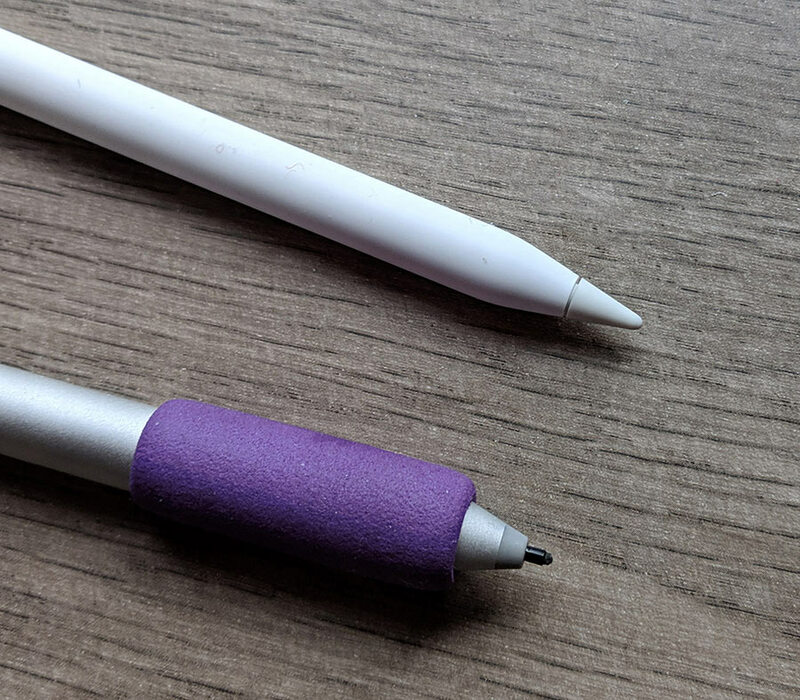 The clear winner when comparing the Surface Pro pen to the 2nd generation Apple Pencil is Apple Pencil. Longer, slimmer, and lighter, than the Surface Pro Pen, the new Apple Pencil is light and feels nearly identical to a traditional hardwood #2 Pencil. The 2nd Generation Pencil is the only Apple stylus compatible with the 2018 iPad Pro. The new pencil is shorter, and features a more matte –and easier gripped- finish than the first generation Apple. 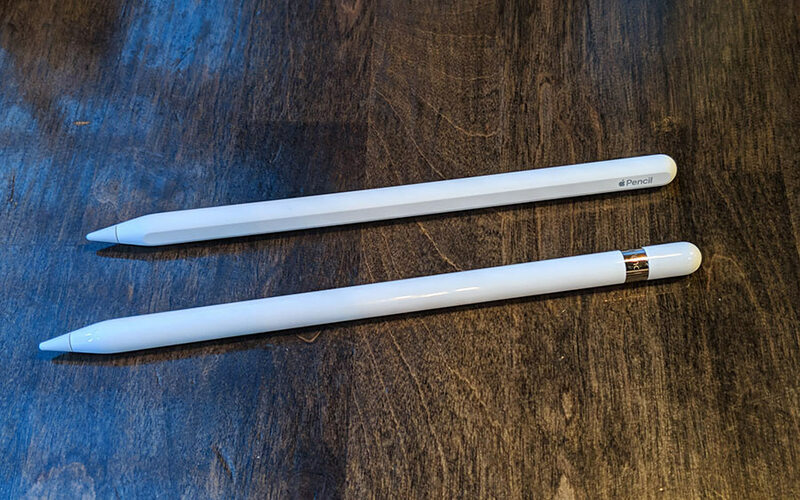 The Apple Pencil 2, compared to the first generation, seems to have reduced weight by shortening the length. While shorter than a traditional pencil, it does make sense. We are used to long styluses based on traditional pencil dimensions, but those pencils were designed to be usable as they were sharpened down to a shorter length. By creating a shorter pen, Apple seems to have improved the balance of this digital drawing stylus. STYLUS TIPS: Initially I expected to hate the hard tip of the Apple pencil. While the Surface Pro has a small advantage in that the tips (or “nibs”) are interchangeable to achieve the desired tactile feel, the Apple pencil, in action, doesn’t have the “hard plastic on tempered glass” rigidity I expected to feel. Instead, using the tip of the Apple pencil feels rather natural, and I was delighted to find that the Apple Pencil is responsive to drawing with the side of the tip – just like a traditional pencil can be turned on its side for shading. This is a feature of the current surface Pro pen lacks. Surface Pro pen: contains replaceable batteries. Time will tell how the Apple Pencil holds up to being stored in the charging position, but it’s a significant improvement over the previous generation Apple pencil which charged by being plugged in to the iPad directly. The Surface Pro Pen’s battery-powered setup works well, but locates weight in the upper portion of the pen. As a heavy user, I’m curious whether this weight distribution has contributed to the issues I’ve had holding the Surface Pro pen for long periods without fatigue or hand cramping. I really wanted to like Sketchable, the Microsoft store’s most well-developed digital drawing app. Both apps allow for brush customization, working in layers, and exporting to Adobe Photoshop. Sketchable rivals procreate respectably, but falls short in three areas: replay, organization of existing art, and in the transform feature. if you’ve heard about procreate through social media, you probably saw it by watching a recap of an illustration being created. This is one of the most fun features of procreate and one that cannot be replicated within sketchable, even when paired with outside screen-recording apps, was never able to reproduce the clean, menu-box free recording of my art. In iPad Pro, Procreate organizes completed and in-progress drawings in the folder-tree dialogue we are all used to. It’s easy and intuitive to find previous drawings quickly. 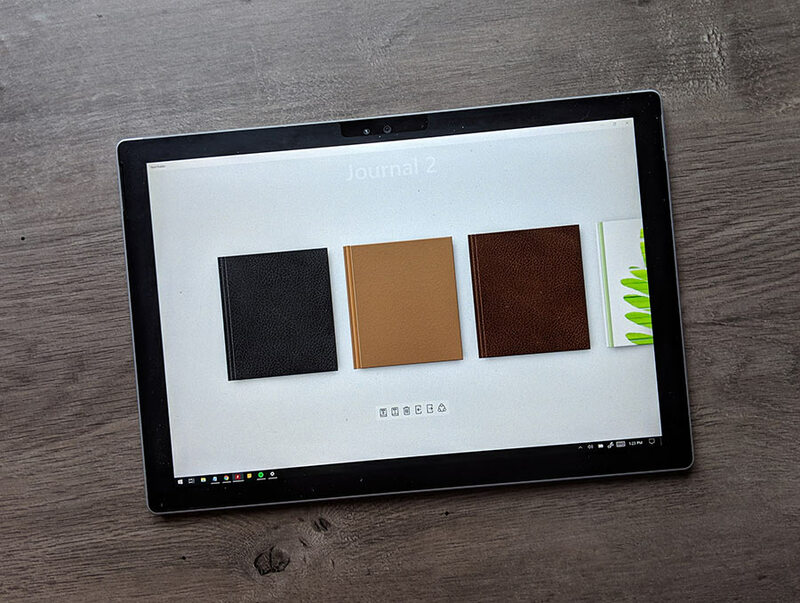 On the surface, Pro 4’s Sketchable, however, drawings are organized into sketchbooks and sketchbooks are difficult to navigate visually- exploration is slowed significantly by having sketchbooks full of complex multilayer drawings. the ability to replay and better organization are great, but what really convinced me to switch to digital drawing on the iPad is the ability to select areas of the drawing and transform that area – cutting, pasting, stretching, resizing, etc. this feature, critical in every digital media I can think of is for some reason missing from Sketchable. Although it can possibly be remedied through an export and reimport – often layers and detail are lost through this process. For the casual doodler or artist, the Surface Pro and the Surface Pro Pen are more than powerful enough to capture your vision. 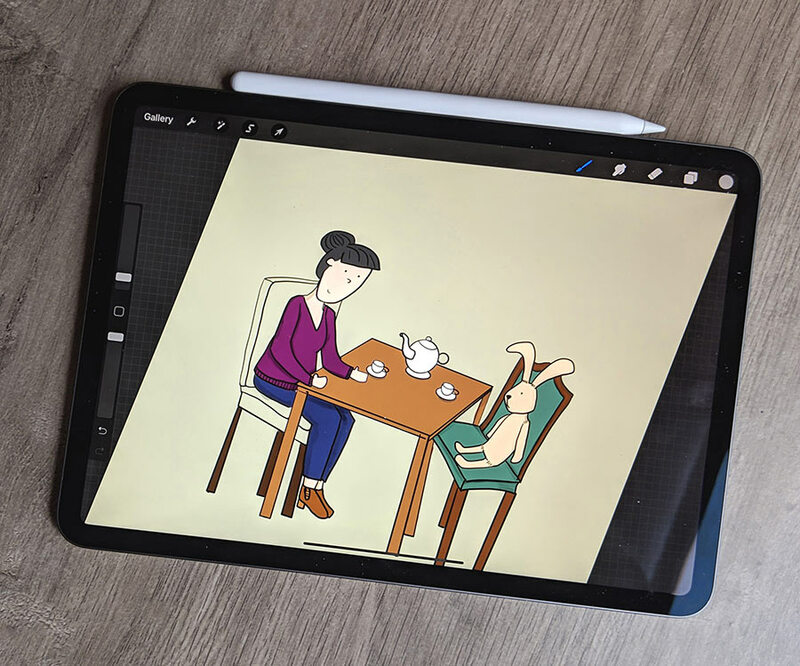 For serious artists and those who aspire to become more serious about creating art in a digital format, the iPad Pro and the 2nd Generation Apple Pencil pencil are, in this artist’s opinion, the best option for bringing your digital art to life. Despite the fact that the iPad Pro outperforms the Surface Pro 4 in digital drawing stylus and available digital drawing apps, I’m not getting rid of my Surface Pro 4 any time soon. 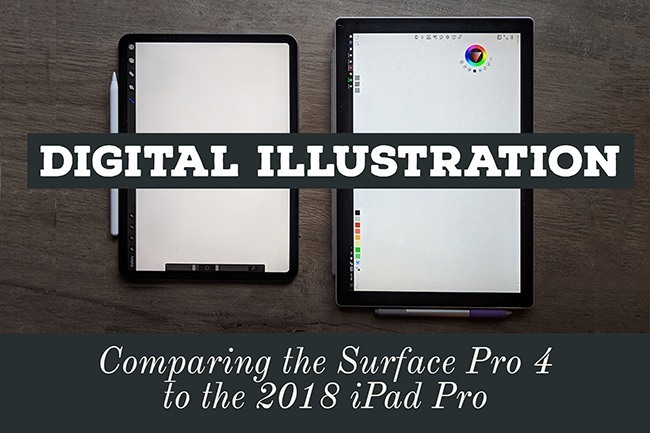 For the versatility needed to maintain this blog, administer databases, handle e-commerce, update spreadsheets, and use the full features of software like Photoshop and Dragon Dictation, the Surface Pro wins every time. I’ll begin packing soon for a post-graduate trek to South America, and even as I pack ultra-light, both of these tablets will still find their way into my bag for the journey. Love this comparison evaluation, Lindsay! I have never used the Surface Pro so cannot speak for it, but I love my ipad pro/apple pencil combo for grad school. I can’t imagine doing school without it. 🙂 I’d love to hear more about how you use Procreate since I haven’t found a drawing app I particularly love yet. Happy drawing!